(say THAT 3 times fast!). Out walking the dog, I landed a major garage sale find last weekend. I’m not usually one for garage sales but this one was special. It was the rare garage sale where older neighbors are moving and everything had to go. Amid the linens, cheese knives, smoker and copper pans I found a Cuisinart. Not just any Cuisinart, a vintage Cuisinart! Because of my vintage Cuisinart, I’ve been feeling in a retro sort of mood lately. When I baked a ‘lil carrrot cake for my Dad’s birthday, I used my Cuisinart and went with a retro photo theme, too. The holy grail of Cuisinarts – a genuine 1970’s era DLC-7 Super Pro model made in Japan. All the bells and whistles: a white & brown knit cover (seriously!! ), 11 blades for dicing ‘n slicing, even a meringue egg whipping attachment. All of it in mint condition. Priced at $75, I bargained her down to $50, then $40 for this awesome piece of history. This baby is powerful. I couldn’t wait to test her out! For my father’s birthday, I baked a carrot cake which, as you may know, involves a lot of grating of carrots. By hand, it takes 8, maybe 10 minutes of grating [and lots of scraped fingers, in my case]. With this Cuisinart, we’re talking seconds. Yeah, baby! 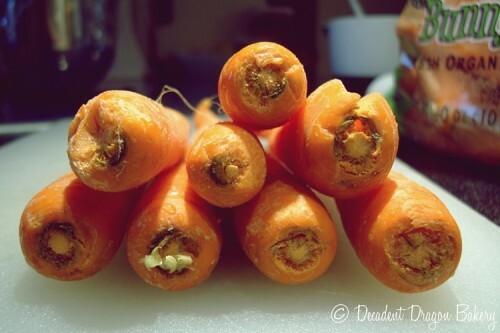 For the best carrot cake, use fresh, young, organic carrots. My ideal would be locally grown but my CSA isn’t selling any right now. So I purchased the organic carrots at my local supermarket. The carrot cake is amazing. 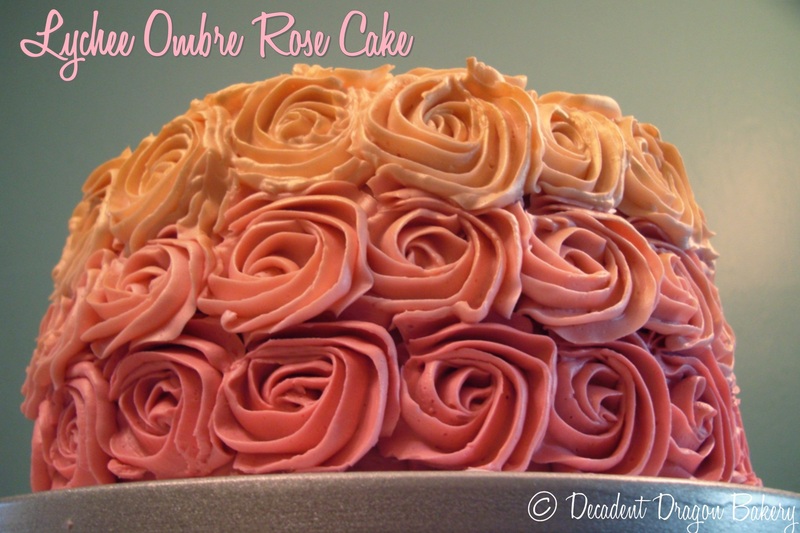 I make this recipe for my mom, dad AND husband every year for their birthdays. It’s a dense cake that pairs really well with the creamy tang of cream cheese frosting. For now, just pair this retro carrot cake with your favorite cream cheese icing. 1. Pre-heat the oven to 350 F. To make your life easier, grease and line the baking pan with parchment rounds (otherwise you may have trouble getting the cake out of the pans). 2. Grate 3 cups of fresh carrots. If you have a Cuisinart, use it! 3. In a large bowl, combine the sugar, flour, salt, spices, baking soda, vanilla and oil. Beat the eggs in one at a time. Stir in the carrots, walnuts and raisins. 4. Pour batter into your prepared pans and bake for up to 40 minutes. Check the cake with a toothpick for doneness. 5. Remove pans from oven and cool on a wire rack. 6. 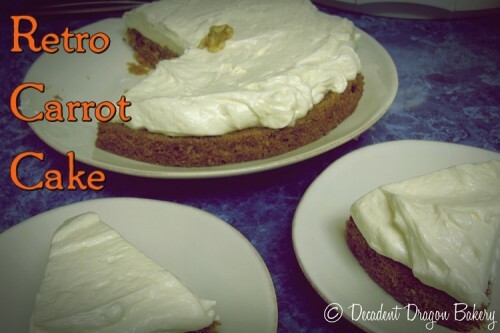 Ice my retro carrot cake with your favorite frosting and enjoy! Too much icing? This is how my family likes it. And remember SMB is not too sweet. Like I mentioned above, the frosting was temperamental But I think Cream Cheese Swiss Meringue Buttercream has so much potential. It’s tangy, buttery and not too sweet. 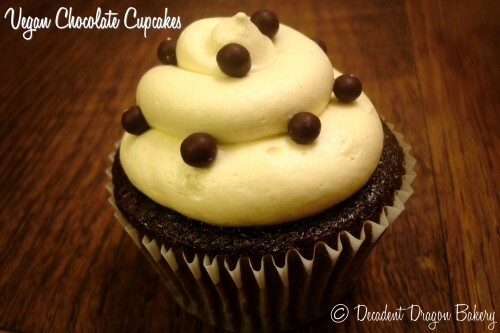 Do you have a favorite cream cheese frosting recipe? Let me know in the comments! When I saw Martha Stewart’s Fish Cake on Pinterest, I just had to do it for myself. 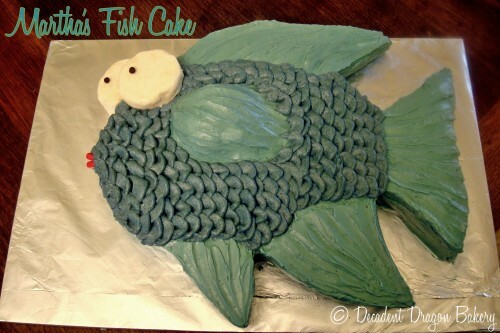 This is a fun, whimsical cake any beginner baker can pull off…swimmingly. To start the new year off right, I decided to try my hand at this adorable little fish cake. I don’t typically make resolutions but if I did, my resolution would be to spend more time doing the things I enjoy most – like baking ridiculously shaped animal cakes. Martha Stewart has a full tutorial and templates for making the Fish Cake on her website. I made a few basic changes, including subbing a chocolate cake with chocolate chips. Because you can never pack too much chocolate into a cake. For Christmas, I received a Made in USA 13 x 9 pan from my Mom. It worked beautifully for baking the two (2) sheet cakes necessary to put this cutie pie together. I kept wondering what filet I’d choose once the cake was finished. NOTE: The recipe above makes ONE sheet cake. You will need to make TWO sheet cakes to create the fish. You can try doubling this recipe for two pans but I have not tested it. Preheat oven to 350F. Grease your pan and line bottom with parchment paper to prevent sticking. If you don’t have parchment, flour the pans too [and pray to the non-sticking gods]. 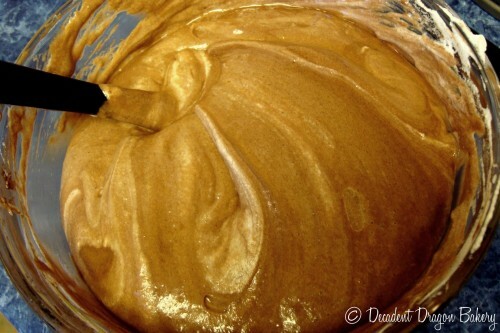 Mix together sugar, flour, baking powder, baking soda, salt and cocoa in a large mixing bowl. Add eggs, milk, vegetable oil, vanilla extract and mix on medium speed for two (2) minutes. Scrape mixing bowl to ensure ingredients are thoroughly mixed. Stir in boiling water and coffee to the batter. The batter will be thin and watery but don’t worry! Pour the batter into your pan and bake for 20-25 minutes. Test with a toothpick. When toothpick comes out clean, the cake is ready. 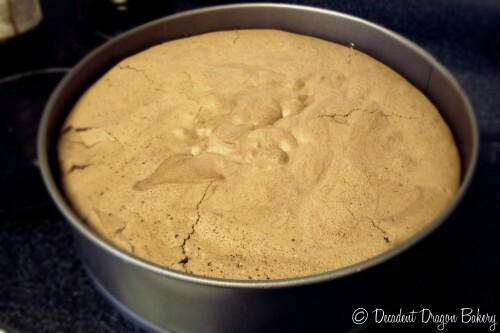 Remove cake from the oven and place on a cooling rack. Let cool for 10 minutes and then remove from pans onto a wire rack. Let cool completely. If not ready to frost yet, wrap with plastic wrap and refrigerate or freeze for longer storage. 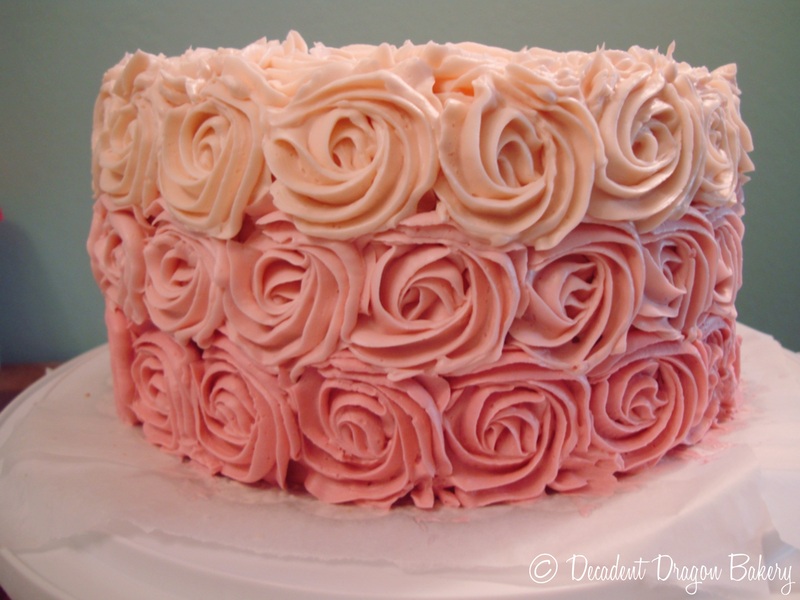 I recommend Swiss Meringue Buttercream (here’s a good recipe from SmittenKitchen) frosting but just about any frosting will do for this cake. Prepare PLENTY, around 8 cups. 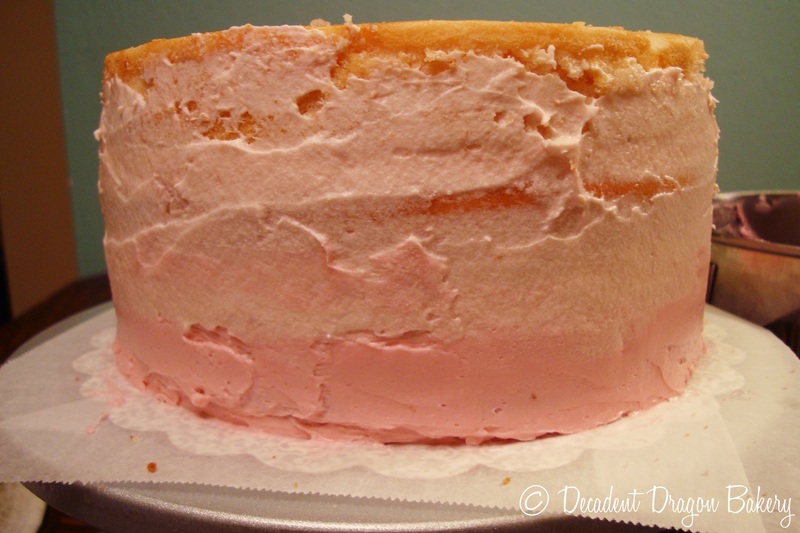 If using Smitten’s recipe, I would do a double batch of the 9-inch cake. You don’t want to ration your frosting…it’s no fun. Reserve 1 cup of un-dyed, white frosting to color the fish eyes. Tint the rest of your frosting a light teal color. 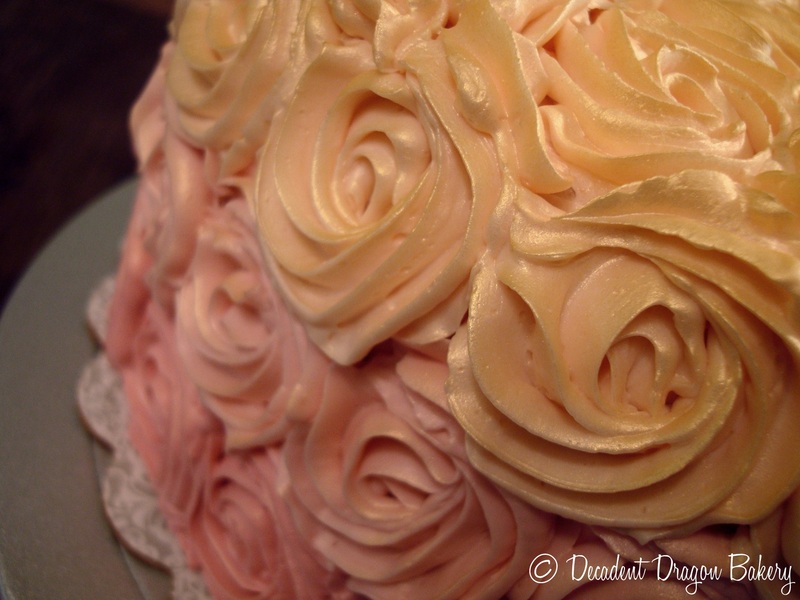 I tinted my frosting with Wilton’s Cornflower Blue and Yellow. You can also use teal or other blue and yellow colors to achieve the teal effect. Or try different colors if you’d like to be adventurous! While your cakes are cooling, prepare your fishy templates. Print out the template from Martha Stewart’s website. With scissors or a sharp razor, cut the templates out. One thing I’ve found alleviates frustration in the kitchen is having the right tools for the job. My husband’s razor blade and my cutting mat (found in a sewing supply store) made this job so easy. I also used the razor to cut parchment paper for my pan. Next, lay the fish templates over your sheet cakes and use a knife to trim to size. Your trim job doesn’t have to be perfect. You’ll be icing this sucker up in a moment and that will cover up any minor defects. 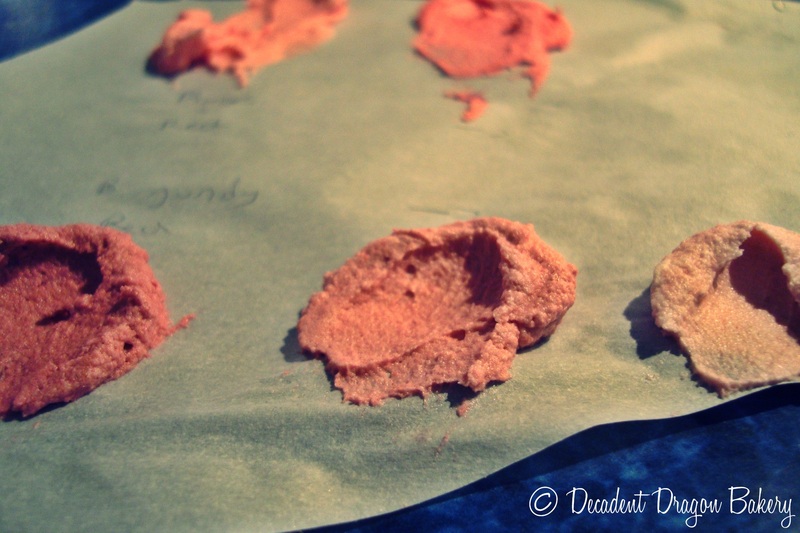 You’ll also have a bunch of little fish parts ready to be tacked on to the cake with your icing. Start with a crumb coat to trap pesky moist chocolate crumbs. 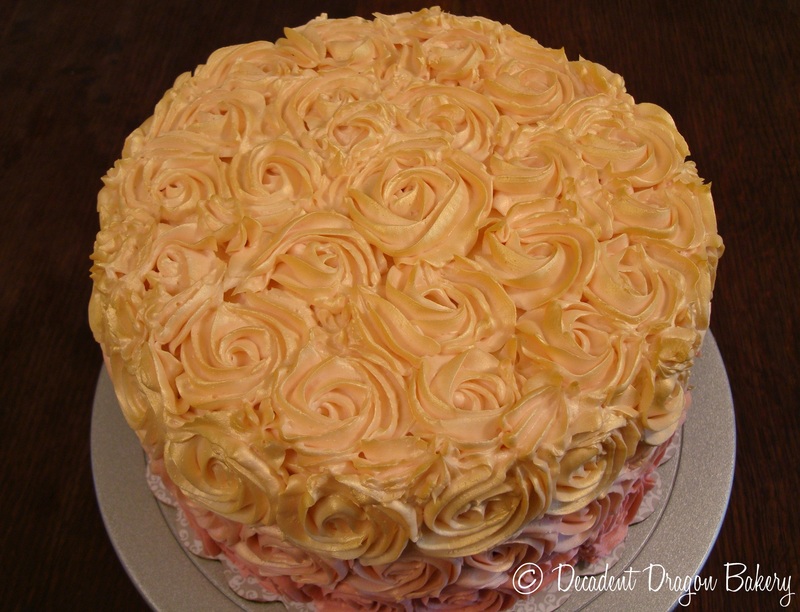 If your cake has been in the fridge/freezer, let it come back up to room temperature before you start icing. Do your crumb coat with a small amount of frosting (perhaps 1 cup). 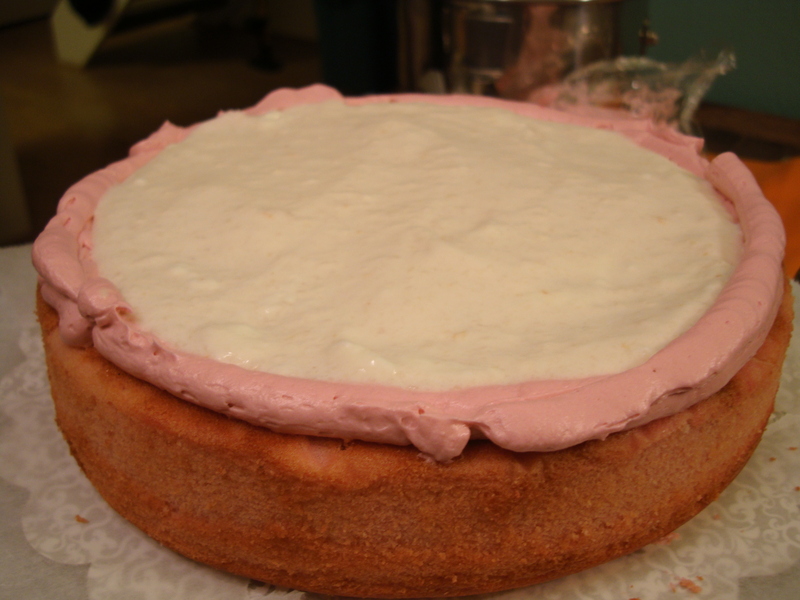 If your frosting is thick, you can thin some of it a little with milk or cream. Attach the fish parts to the body with frosting. The purpose of this coat is to just catch and hold on to all those crumbs. Use the white icing to coat the fish eyes. 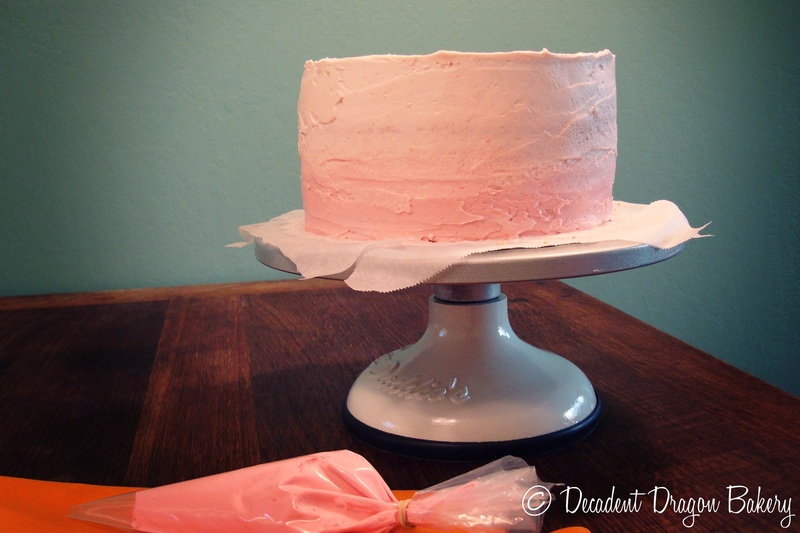 After you finish your crumb coat, stick your cake back in the fridge to harden the frosting. Wait 30 minutes and then feel the frosting to see if it has dried out / crusted. If it hasn’t, wait a bit longer. 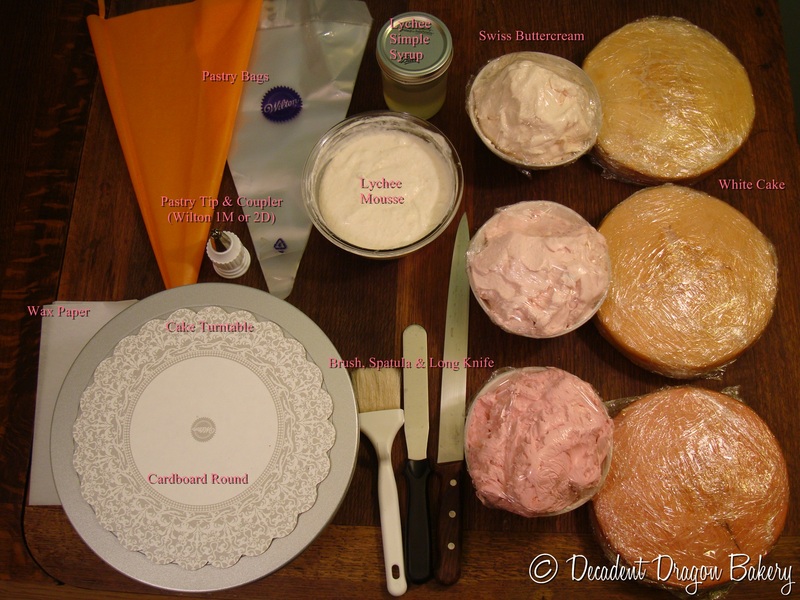 Pull your cake out and let it warm up a little before applying the next coat. 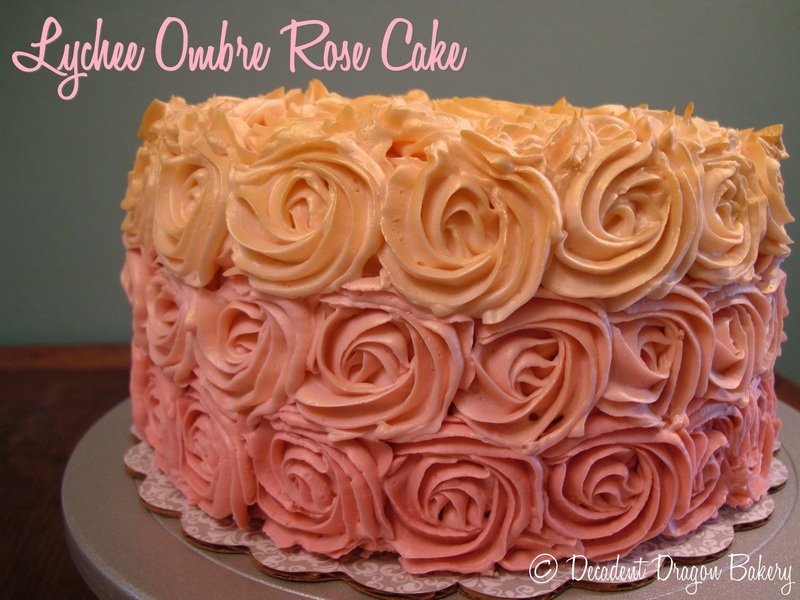 Apply a full coat of frosting to completely cover the cake. Coat the eyes in white frosting. You can also even out the shape of the fish body while you’re doing this. Take the rest of your teal icing and add a bunch of blue/a little yellow to darken it to a deeper teal blue. Grab a pastry bag and a Wilton or Ateco petal tip (#61 or similar). Fill the bag with the darkened icing. Pipe little overlapping scales starting at the tail end of your fish and piping vertically until the body of the fish is covered. Add the pupils and lips to the fish using candy. I used Valhrona Chocolate Pearls and some red tic-tacs. Martha Stewart uses sunflower seeds and a gummy lifesaver. And there you have it. A finished fishy! Update: wanted to post a photo of the half-eaten cake. Too ridiculous? So what do you do with a few dozen fresh-baked ladyfinger cookies burning a hole in your pantry? You make creamy Chocolate Tiramisu, that’s what. Tiramisu. Chocolate. Tiramisu + Chocolate. Two of my favorite things. Combined into one amazingly, amazing dessert. Not for the Italian purists, perhaps. 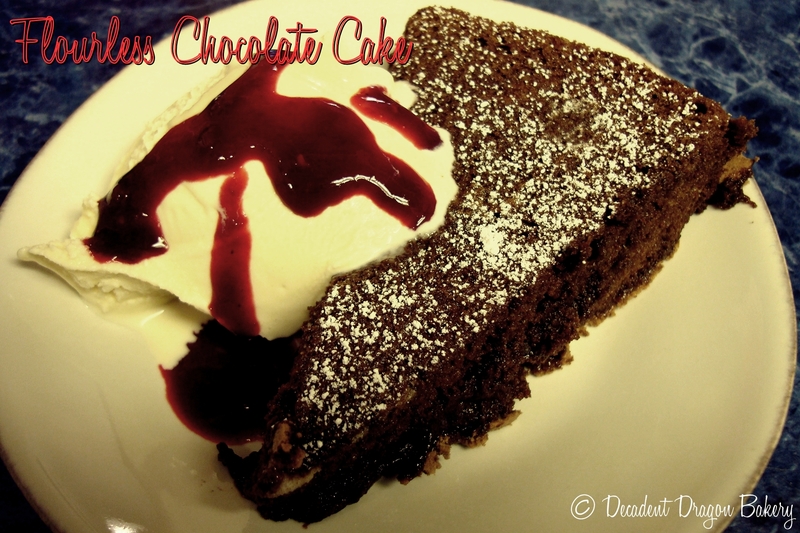 But definitely for chocolate fiends or those interested in a fun twist on the classic dessert. First, we need to make a zabaglione. Pronounced Zab-aye-ohn, it’s a rich egg custard made on the stove. Combine egg yolks, sugar, marsala and salt in a glass bowl (or the top bowl of your double boiler). Whisk until fully mixed. Put bowl over a saucepan of simmering water, without letting the bottom of the bowl touch the water. Whisk the egg mixture until thick and creamy, and the mixture forms ribbons when dropped from the whisk back into the mixture. Remove from heat. In a separate saucepan, combine chocolate and whipping cream. Cook on medium heat, stirring until smooth. Set aside and keep warm. Fold the melted chocolate into the egg custard mixture. Cover and refrigerate until cold. In a separate bowl, beat cream and 1/4 cup sugar in a medium bowl to soft peaks. Fold the whipped cream into the mascarpone. 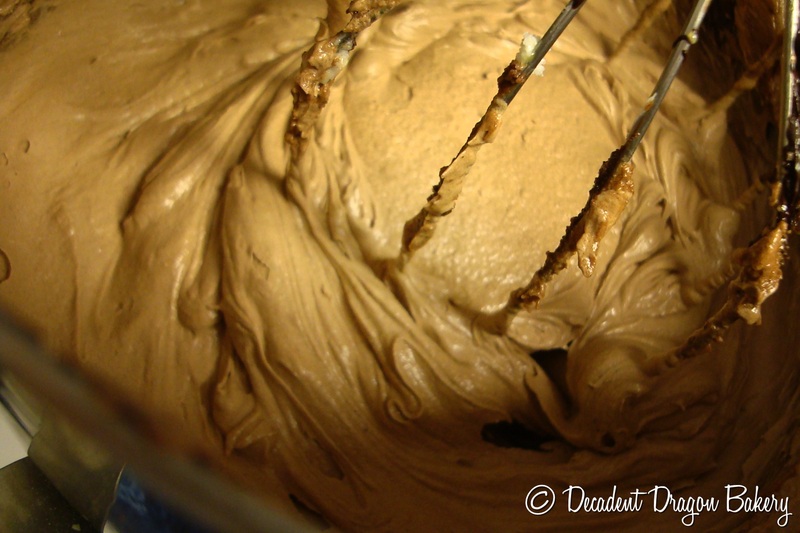 Then fold in the chilled chocolate zabaglione mixture. Cover and refrigerate. Mix it thoroughly – I just liked the marbling in this photo. While the chocolate mixture is chilling, brew some fresh espresso (or reconstitute it, if using instant). Whisk the espresso with 1/4 of sugar until combined. Place some of the espresso mixture into a shallow bowl or tray. Dip ladyfinger cookies one at a time to line the bottom of the pan. You want the cookies to be soaked but still have structure. Spoon 1/3 of the mascarpone mixture on top of the cookies and spread to cover evenly. Sprinkle layer with cocoa powder. Dip the next eight (8) cookies. Spoon another 1/3 of the mascarpone. Dust with cocoa powder. Repeat until all cookies and mascarpone have been used. If necessary, press the final layer slightly to help it fit in the pan. Cover with plastic wrap and refrigerate for at least six (6) hours. 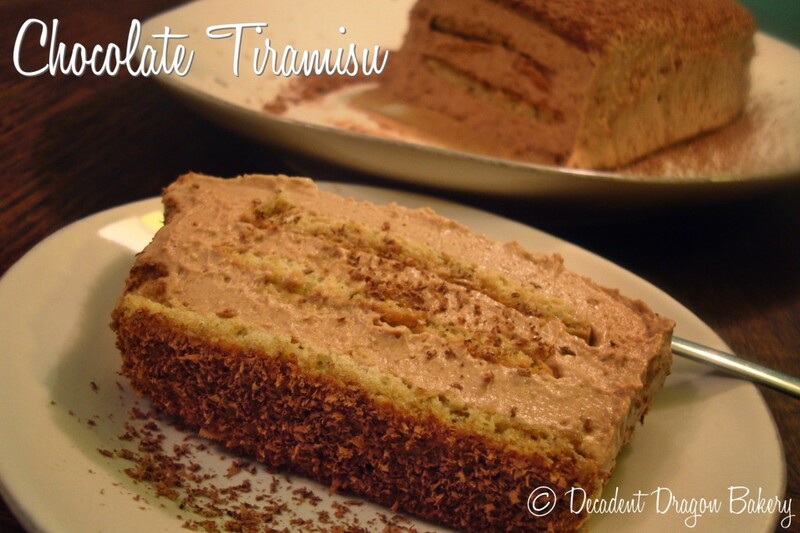 When the Chocolate Tiramisu is chilled, unwrap it and invert it onto a serving plate. Take off the plastic wrap. Sift cocoa over the dish and grate/peel chocolate shavings over the top of the dish (to taste). I did an absolute ton of baking for Thanksgiving! 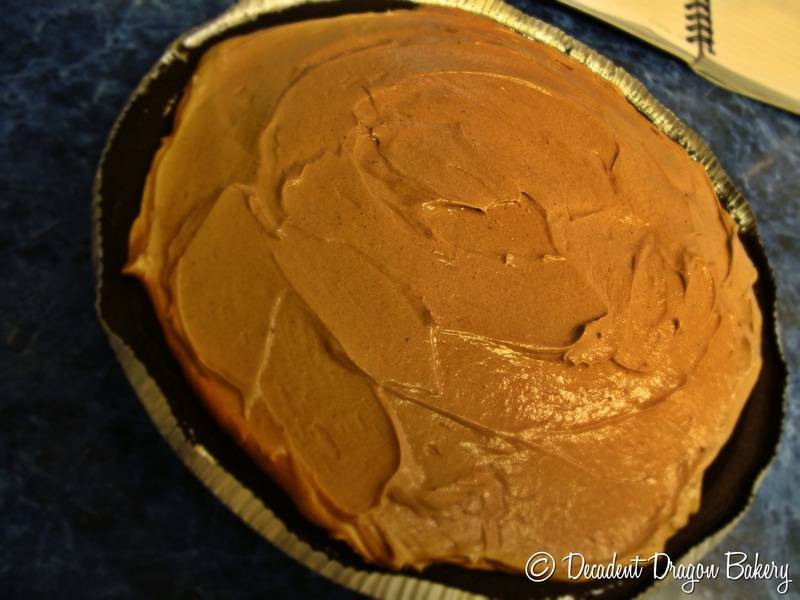 I even made this French Silk Pie twice. A family recipe, this pie is silky smooth with robust chocolate flavor. For me, Thanksgiving is typically a week-long affair. And this Thanksgiving did not disappoint. There were multiple family events throughout the week — a surprise birthday party, mini crab-feed, T-Day (with no T, actually) and a post-Thanksgiving-dinner dinner. So it was easy to whip up a few of my favorite desserts! It’s difficult to photograph food when you have guests salivating behind you. They just don’t appreciate that you need a few minutes alone with the holiday pie! While I appreciate artistry in my food, I don’t think anyone wants to eat a piece of art. Too destructive, too many guilty feelings. That’s why I love ugly food. It’s the food we were all raised on. I think of how my Grandma and I enjoyed gooey hot fudge sundaes together. Ugly food is over-the-top and messy. It tastes like childhood. And that’s what this French Silk Pie tastes like to me. Making this pie is really easy. This is adapted from my mother-in-law’s amazing recipe. You may know this pie as Chocolate Satin instead of French Silk. Please be aware, this French Silk Pie does contain raw eggs, which are unsafe for some groups of people. Try a different pie if you are pregnant, have a compromised immune system or feeding young children. Or, if you can find pasteurized whole eggs, that would work! 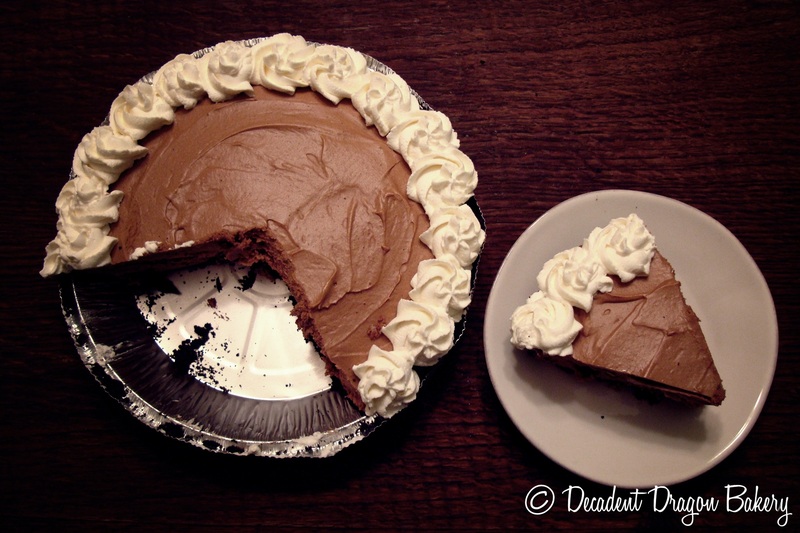 Begin by preparing your chocolate pie crust. Once prepared, chill the crust in the fridge or freezer. Next, chop up your chocolate and microwave in 15 second intervals until fully melted, stirring after each interval. Set aside and let cool. Add your softened butter to the bowl of your stand mixer or large mixing bowl. Cream the butter on medium until lightened, about 1-2 minutes. Slowly add your sugar while beating on medium speed. Beat butter and sugar mixture until fluffy, about 2 minutes. Go ahead and add the final two (2) eggs, and beat the mixture on medium-high speed for five (5) more minutes. Continue to scrape the bowl periodically to ensure everything is evenly mixed. You’ll end up with a smooth, mousse-like mixture. After you’ve finished mixing, pour the mixture into your chilled pie crust. Smooth out the filling with a spatula. Refrigerate for at least four (4) hours. Lick the mixing bowl and spatula thoroughly. Once the pie is thoroughly chilled, cover with whipped cream and any topping of your choice. Served well chilled. Where’s the other slice, you ask? The husband got to it! 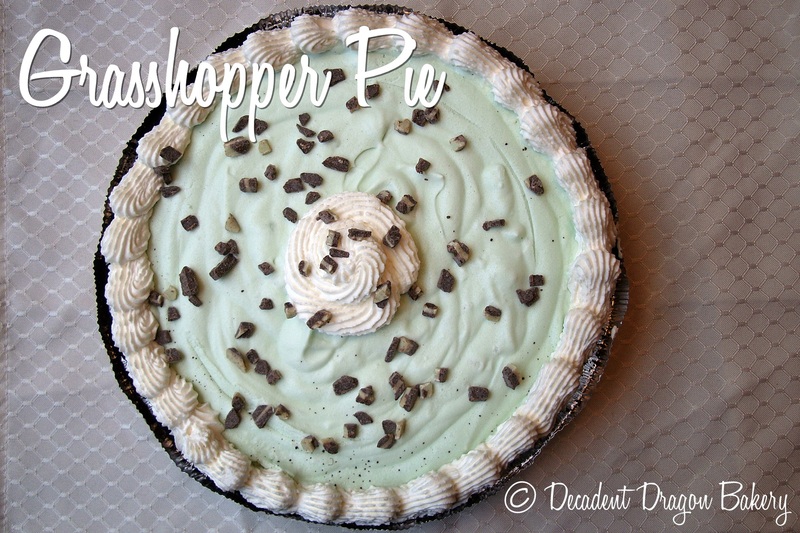 I know you’ll love this pie, especially if you enjoyed my Grasshopper Pie post. This pie is a down-to-earth dessert, just waiting to become your holiday tradition. I hope you enjoy it! Do you have an ugly food recipe that you love, too? Tell me about it in the comments! A homemade spin on this classic freezer pie. 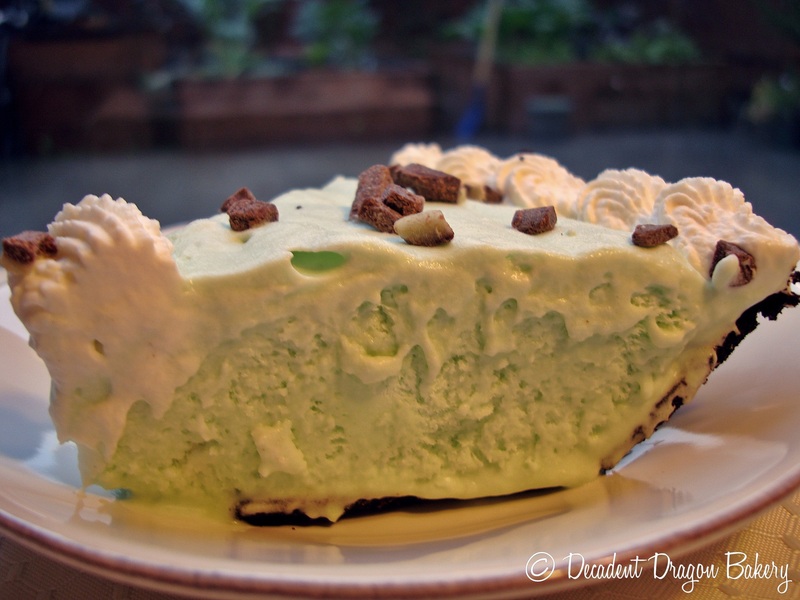 Decadent Dragon’s Grasshopper Pie uses homemade marshmallow cream, creme de menthe and creme de cacao liqueur. Smooth, rich and minty. Growing up, my sister’s favorite birthday cake was a Grasshopper Pie from Baskin Robbins. This Grasshopper Pie is a little different – it uses freshly whipped marshmallow cream instead of ice cream. 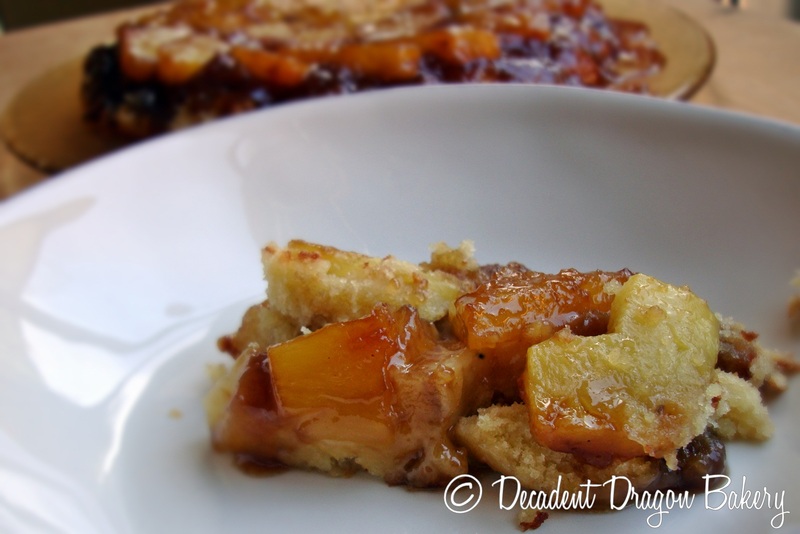 But I think you’ll find its silken texture and flavor make for a great grown-up version. When you find yourself with a bunch of extra egg whites, like I did after making my Holiday Egg Nog Grog, this is a perfect pie to use them up. Alright, this recipe involves two parts: first, we need to make our homemade Marshmallow Cream. Then, we need to combine it with our minty pie ingredients. Part 1: Whip up your Marshmallow Cream. This will be the base to your lovely Grasshopper Pie. Combine 3/4 cup of the sugar and 1/4 cup water in a small saucepan over medium-high heat. 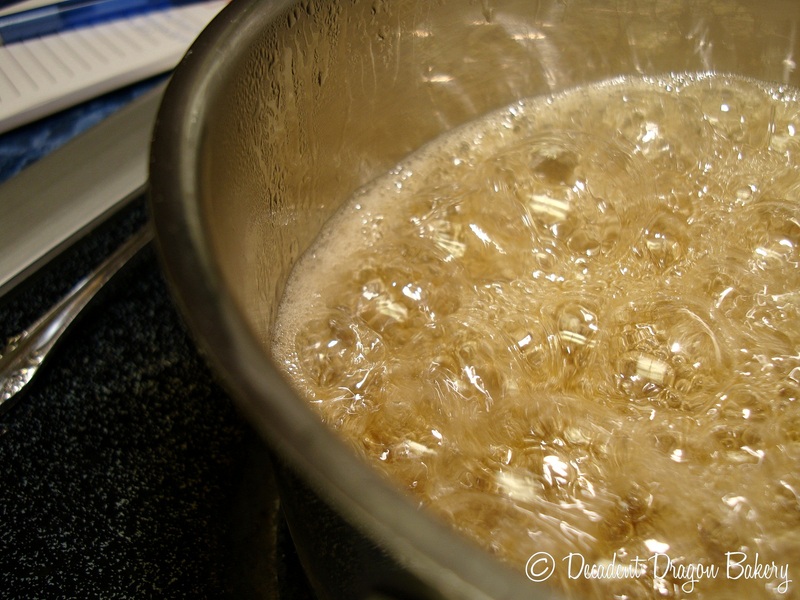 Attach a candy thermometer to the side of the pan and simmer the syrup without stirring until it reaches 240F. You can occasionally swirl the pan gently but no stirring with a spoon, please! 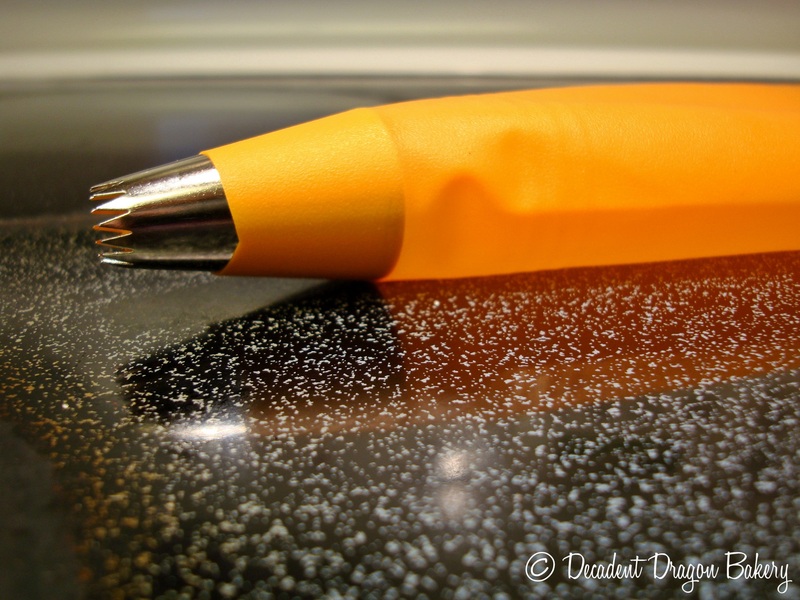 Stirring with a utensil can cause crystallization. While the sugar syrup is cooking (be sure to monitor it closely), you can prepare the eggs. Carefully separate the eggs, making sure no yolk gets into your egg whites. Reserve the egg yolks for another use [like my Holiday Egg Nog Grog]. 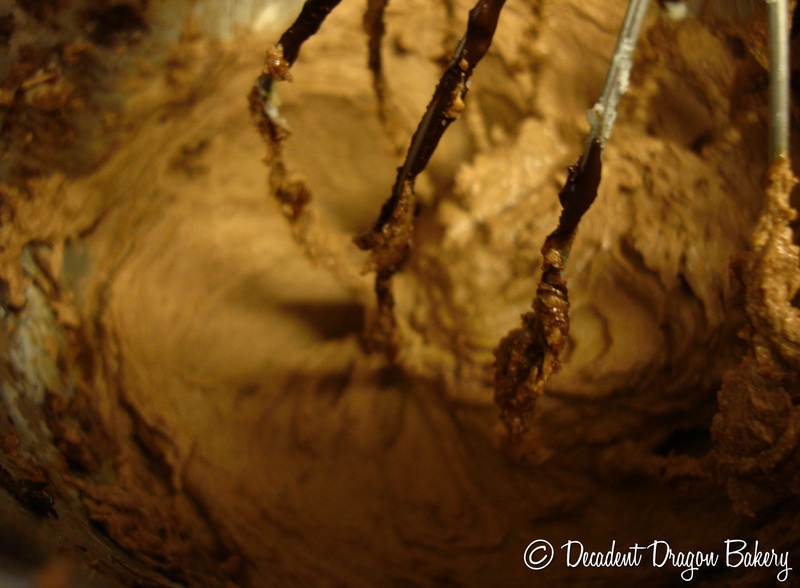 Add the egg whites, vanilla and salt into the bowl of your stand mixer, fitted with the whisk attachment. Whip on high until the eggs are frothy. Slowly begin adding the 1/4 cup sugar. Whip until medium peaks form. Reduce speed to medium, then carefully pour hot syrup into egg mixture in a slow, steady stream while whipping. Increase mixer speed to high and whip to stiff peaks. Reduce speed to medium and whip until marshmallow cream is cool. Use immediately. Random Fact: My husband detests peppermint. So much that he uses kid’s strawberry toothpaste. 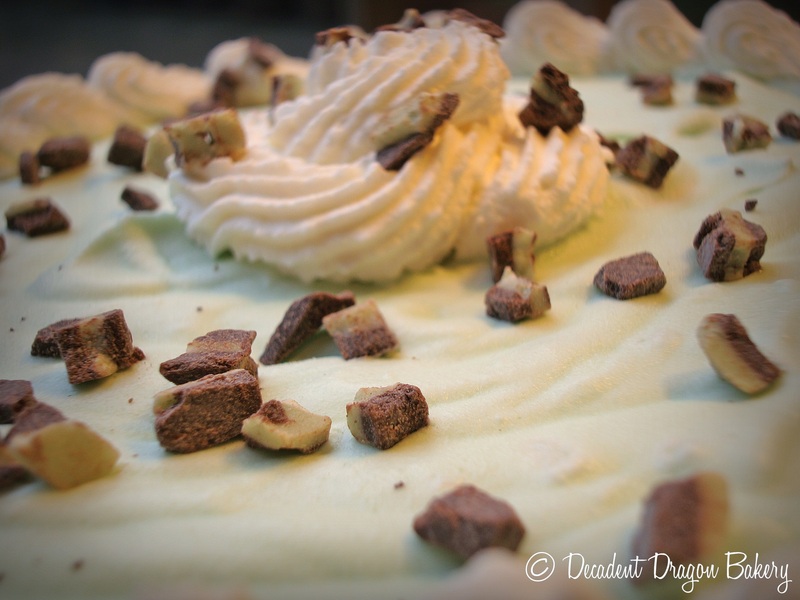 Part 2: Let’s freeze us some Grasshopper Pie. The key to a silky pie is fully mixed and COLD ingredients. Start by pre-chilling your Chocolate Pie Crust. Next, take your Marshmallow Cream and combine with 3 tbsp of heavy cream. Stir to combine until mixture is smooth (if you need to, you can microwave or heat the mixture gently to help with melting the marshmallow). Stir in 2 drops of the food dye until uniform. Chill the mixture in the fridge or freezer while you beat the cream. Take the remaining 1 cup of heavy cream and 2 more drops of food dye and whip until medium peaks form. You want structure but don’t over-beat and make butter! Gently fold in the whipped cream to the marshmallow mixture. Add liqueurs to taste [don't add too much as you don't want your pie to be icy]. Gently scrape the mixture into your chilled pie crust. Pop immediately into the freezer for 4-6 hours. 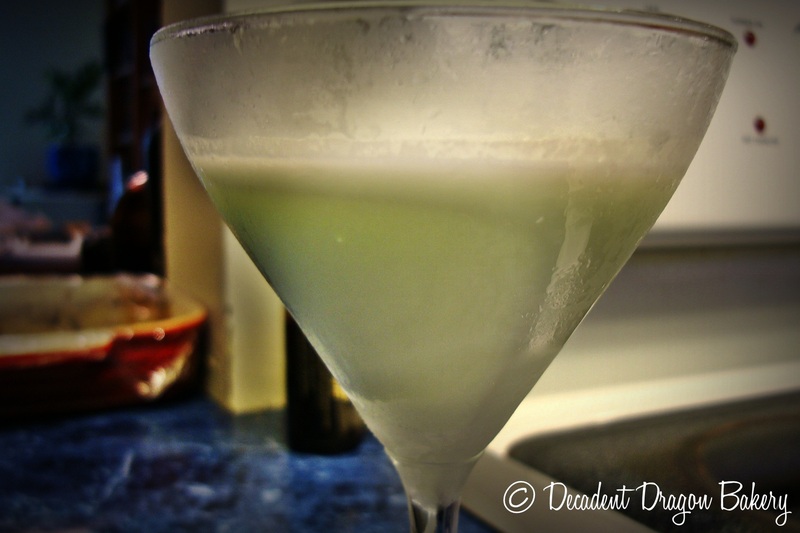 While impatiently waiting for your pie to freeze, make yourself a Grasshopper martini like I did. Truly decadent! Just prior to serving, you can whip some cream to frost the pie. 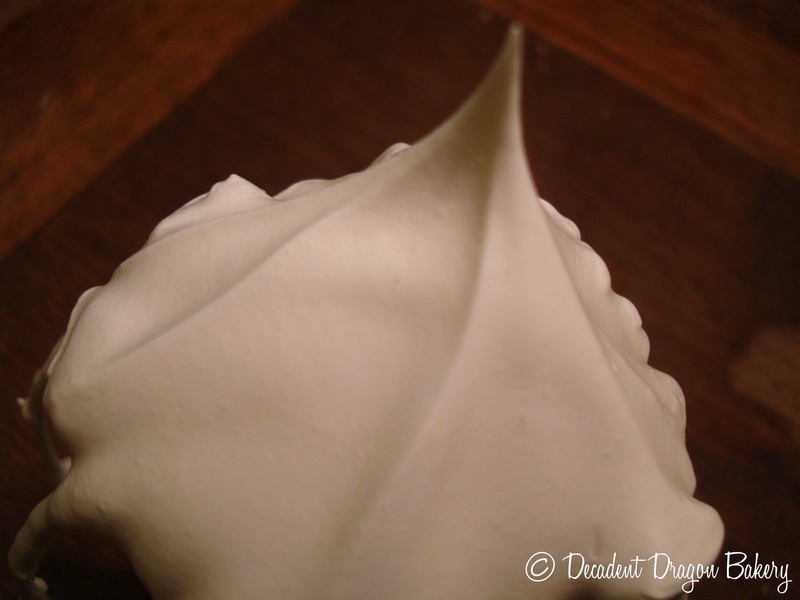 I used a Fat Daddio Pastry Bag and Wilton 4B Open-star tip to pipe my whipping cream. 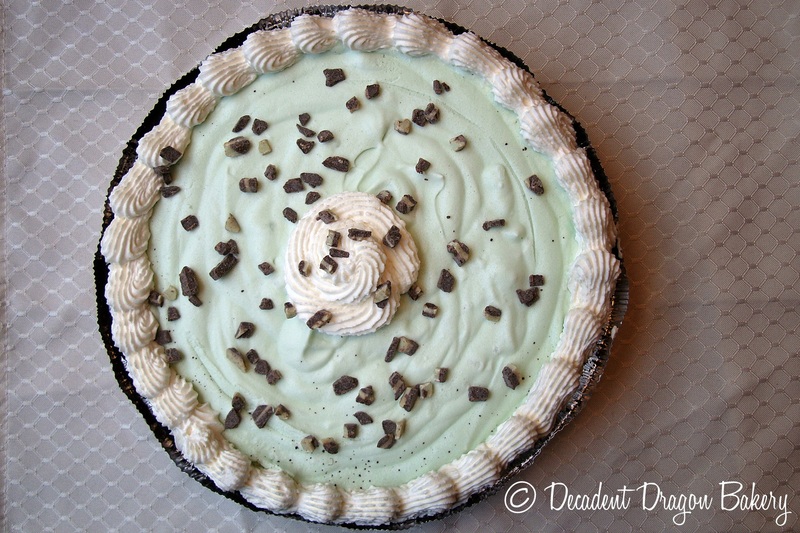 If you have Andes mints or oreos, you can top the pie with them for artistic effect. [Wait, did I already show you that photo? Oh well, here it is again.] Remember, the liqueur in this pie means the melting point is higher and it never fully freezes [you can see how fast it melts in the shot below]. So, keep it cold and eat it quickly! The Takeaway: You don’t have to use my recipe but be on the lookout for freezer pies with lower fat ingredients or too much liquid (water, liqueur, milk, etc.). 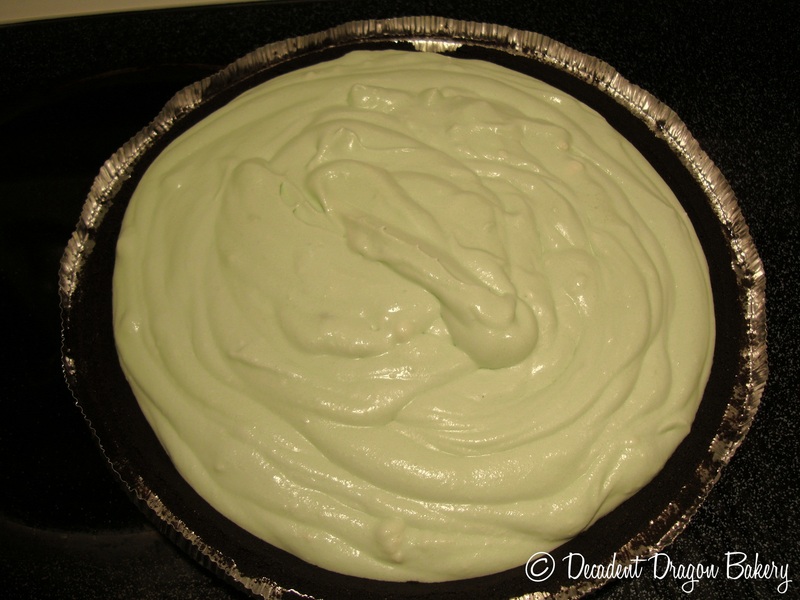 My first attempt at this pie included regular milk and a lot more creme de menthe/cacao. All that liquid added up to a slushy pie. By limiting the liquid and upping the fat content you’ll get a much smoother result. Good luck! Like the many varieties of good wine, honey comes in a spectrum of flavors and colors. This nutty baklava is made with California Meadowfoam honey, which has caramel-marshmallow tasting notes. 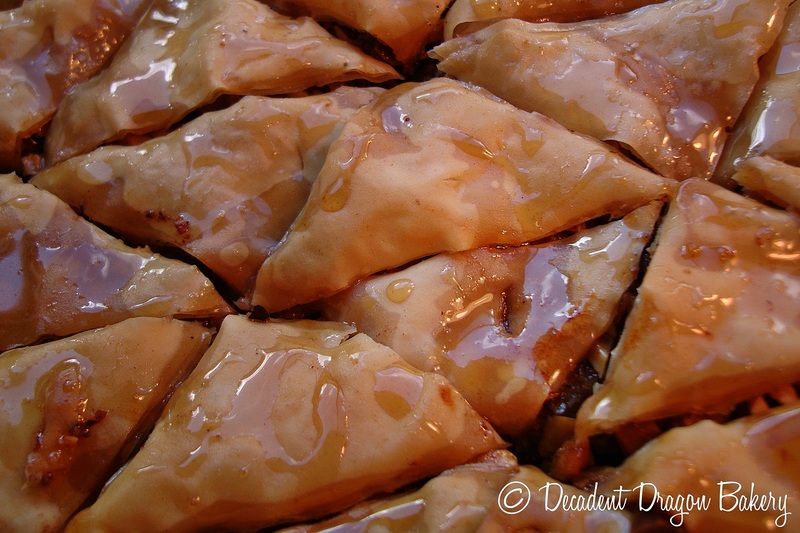 Baklava can be made with any variety of honey you have on hand but I highly recommend using a locally-produced varietal you enjoy. Over the past few years, I’ve sampled my way through the local honey available at our farmer’s markets. Varietal honey is created when honey bees forage primarily from one type of plant, bringing its nectar back to the hive. Thus varietal honey comes in many forms: clover, sage, star thistle, buckwheat, tupelo…the list goes on. Far and away my favorite honey, Meadowfoam is made from the pretty, white meadowfoam flower. But the honey is a deep, amber color. I thought the color and rich vanilla-marshmallow flavor would complement Alton Brown’s Baklava recipe. As hoped, my baklava [the second batch, that is] turned out beautifully nutty, crunchy and with the caramel honey sweetness of this lovely varietal. These cut baklava even resemble honeycomb. Alton’s recipe is quite good, if a little over-complicated and, ehm…pretentious. [No, I don't have a spritz bottle just for rose water!] Also, his written instructions would have turned the syrup into a hard candy. So, I made a few changes. Most importantly, cut the baklava before baking. It will make your life SO much easier. I also recommend cutting back on the sugar in the syrup slightly to let the honey shine. If you don’t have three kinds of nuts, feel free to substitute. Personally, I do think the rose water is important but if you are in a jam it won’t ruin the dish to leave it out. Here’s his recipe with my modifications. 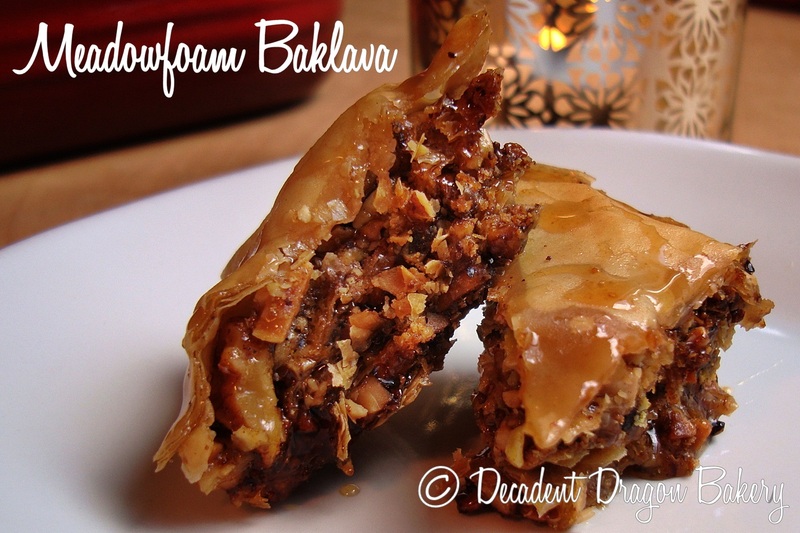 Adapted from Alton Brown’s Baklava recipe. Makes one (1) 9X13 pan OR two 8X8 pans or baklava. Begin by pre-heating the oven to 350 degrees F. Grease your pan(s) with butter. Combine the water and rose water in a spray bottle (or a small bowl if you don’t have a spray bottle) and set aside. Trim the sheets of phyllo to fit your pans. Take the phyllo out of its wrapper and quickly cover with a damp (but not too wet) paper towel. 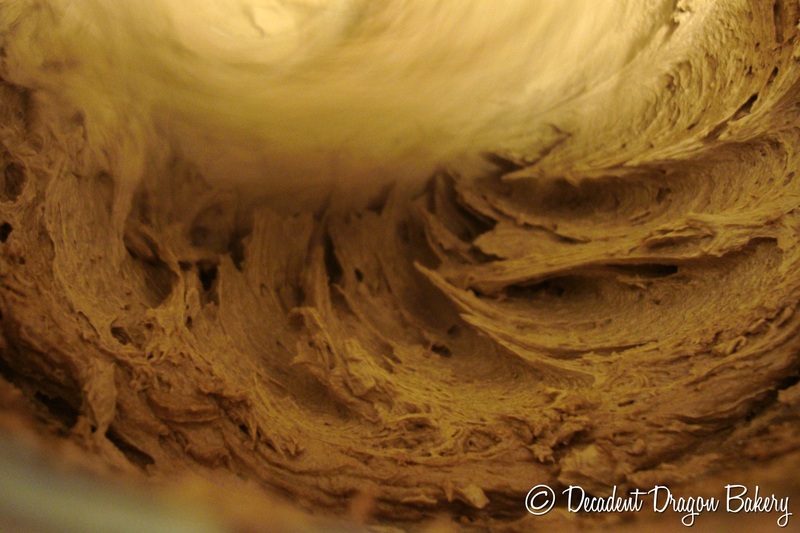 This will keep your dough hydated and easy to work with as you build your layers. Otherwise, it’s a race against the clock, so please use the paper towel! If you are doing the two 8X8 pans, separate your nut mixture into two bowls equally. Set one aside for your second pan of baklava. Place a sheet of phyllo in your pan. Brush with butter to coat. Lay another sheet on top and brush with butter. Repeat until you have ten (10) sheets of buttered phyllo layered in your pan. (Don’t skimp! I’m serious, you want every delicious layer.) Top with 1/3 of the nut mixture (really 1/6 if you are doing two smaller pans instead of the large sheet). Spray or, using fingers, flick with the rose water mixture. Repeat phyllo layering with another six (6) sheets of phyllo dough, brushed with butter. Add the next 1/3 of the nuts and spritz with rose water. Repeat with another six (6) sheets of phyllo, butter and last 1/3 of the nuts and rose water. Top with eight (8) sheets of buttered phyllo. Butter top generously. If doing a second pan, repeat the steps above. 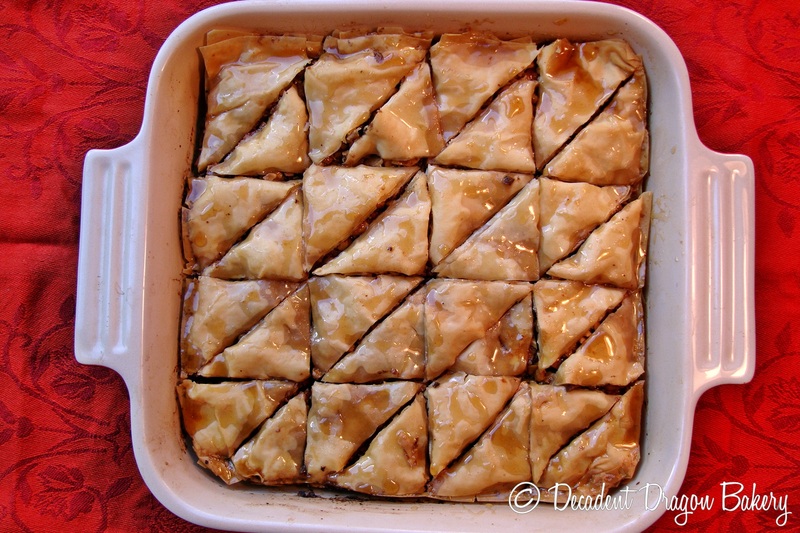 Cut the baklava into serving-sized pieces using a sharp knife BEFORE placing into the oven . Put pan(s) in the oven and bake for 45-60 minutes. Remove when the phyllo is a medium brown color and crispy. The nuts should be toasted throughout. Let cool for 2 hours. Make the syrup during the last 30 minutes of cooling. Combine honey, water, sugar, cinnamon stick and orange peel in a 4-quart saucepan and set over high heat. Stir occasionally until the sugar has dissolved. Once boiling, boil for 3-5 minutes, stirring occasionally. Remove from the heat and discard orange peel and cinnamon stick. What’s your favorite type of honey? When your husband works as an agricultural Biologist, you get used to “produce surprises” appearing in your kitchen on a semi-regular basis. Sometimes it’s a pound of local, fresh honey, others a little bean sprout begging to be planted. This week, it was a box of three, extremely ripe pineapples. And one of them became this scrumptious rum-laced cake. Whenever these culinary surprises show up, I imagine myself a star on Iron Chef, tasked with creating a meal from our new found bounty. Silly? Probably. With the pineapple, I was looking to highlight the sweet and tart flavors of fresh pineapple – almost like a tribute to the end of summer now we’re firmly in fall. 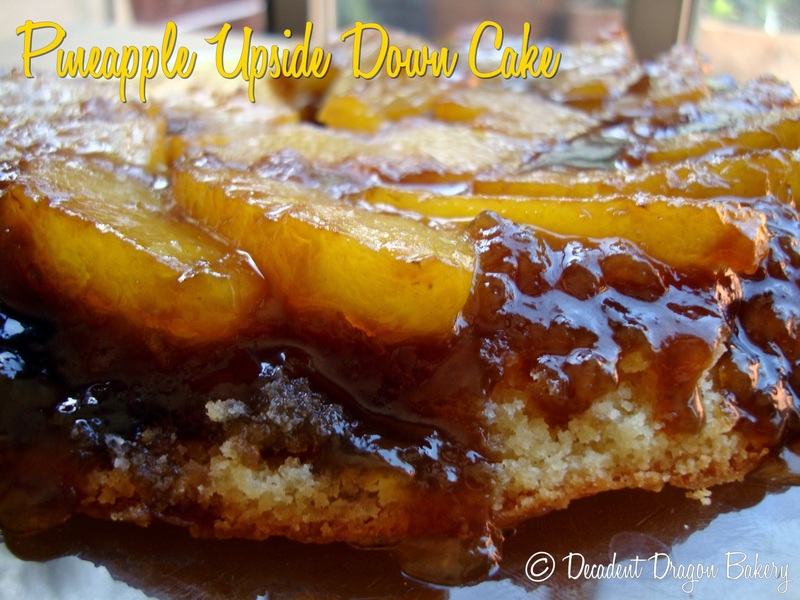 And so the inspiration for this Pineapple Upside Down Cake was born. This pineapple was a truly beautiful thing. Incredibly sweet and ripe, with low acidity (well, for a pineapple anyway). I found a lovely recipe on Smitten Kitchen’s blog. Like her, I chose to omit the ground cardamom from the cake — though I did go back and garnish with cardamom afterward. Cardamom does a good job of balancing the rather intense sweetness of this cake. I also added more RUM than she called for in her recipe. Excellent Appleton Estates rum. I swear, this blog should be call the Drunken Dragon sometimes. I put rum in the caramel topping, rum in the batter and garnished with rum once the cake was baked! Overall, this produced an excellent cake. I highly recommend it. My one suggestion would be to lessen some of the sugar in the recipe: perhaps a 1/4 cup less in the batter (beware as I haven’t tested this). 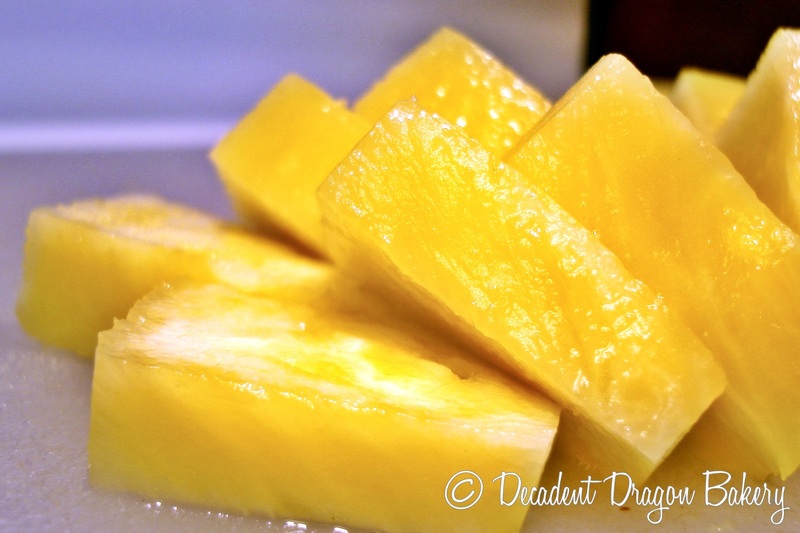 Particularly if you are using a sweet pineapple, the sugar can likely be cut back a bit. 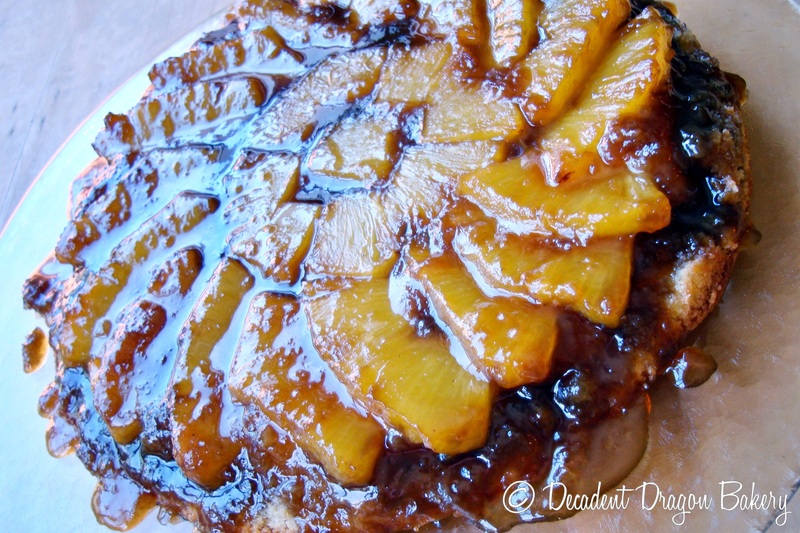 This cake emerges from your cast iron skillet with the most beautiful caramel and pineapple topping. And on a side note: does anyone else think the picture above looks like a spiral galaxy? Haha, I do!